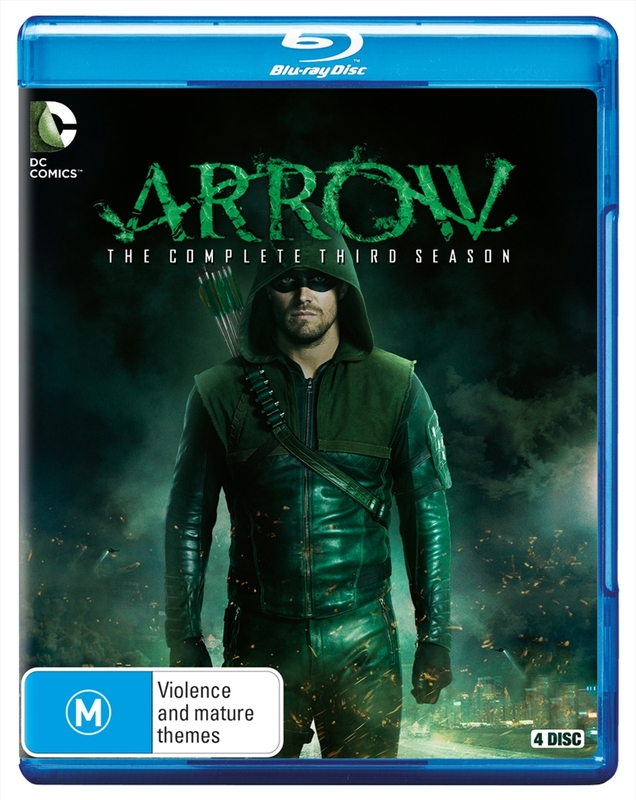 The Arrow has become a hero to the citizens of Starling City but that doesn't mean that Oliver Queen can take his eye off the ball and lead a normal life in the spectacular third season of the hit series based on the DC Comics character. A new wave of diabolical masterminds from homegrown terrors inflicted by the resurgent Vertigo, the deranged Cupid, boomerang-wielding Digger Harkness and bloodthirsty "Brick" Brickwell to the insidious and pervasive havoc wrought by Ra's al Ghul and the League of Assassins threatens all he holds dear. Team Arrow has grown into a powerful force, but the dangers and secrets that hold them together often put them at odds with each other, as the shadows cast by Malcolm Merlyn and the invincible Ra's al Ghul trigger shifts in loyalties and alliances that test them to their core. For matchless heroism under fire, this action-packed Season Three can't be beaten!